California’s Sidewalk Society returned this August to the Fruits de Mer roster with four cover tunes, two by The Action and two by David Bowie. FdM is noted for resurrecting obscure bands and songs and The Action is no exception. The Action were a 60s UK band who released a number of RnB and then psych singles, but never an album. For this release the Sidewalk Society’s David Lawrence decided to cover a couple of demo versions by The Action and a couple of obscure Bowie tracks from the late 60s. Each side of the 7-inch contains a Bowie cover followed by an Action cover. Side One starts with “Can’t Help Thinking About Me,” the first single released after David changed his last name to Bowie. This cover has a garage rock 60s feel and there is some resemblance in the vocals to Bowie. The second song is “Look at the View,” a song with a West Coast feel and inspiration from The Byrds. This is a hippy-dippy song full of sunshine and flowers. 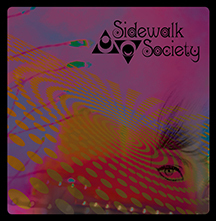 Side Two starts with a cover of Bowie’s “Let Me Sleep Beside You.” The original is somewhat sinister, but the Sidewalk Society’s trippy psych version is great and it features a cool violin break. The fourth track is The Action’s “Strange Roads,” a happy upbeat song with strumming rhythm guitar and a tasteful lead. Quite a nice little package of some songs most of us have not heard before.